Is it time for the six-man rotation? With spring training finally underway, all the ridiculous ideas of how to fix baseball are ready to be put to bed. They are usually the product of long, cold winters when analysts and writers like me go stir crazy waiting for baseball to start. But when the ideas come from those that actually wear the uniform, we have to at least listen. Talking to reporters in Florida this week, New York Yankees pitching coach Larry Rothschild threw out the possibility of the Yankees using six starters early in the season. He wouldn’t call it a six-man rotation, though essentially that’s what it would be, even if just temporary. The Yankees have a tough stretch of 30 games in 31 days starting in mid-April and they already have a rotation that is littered with recent injury and performance history. 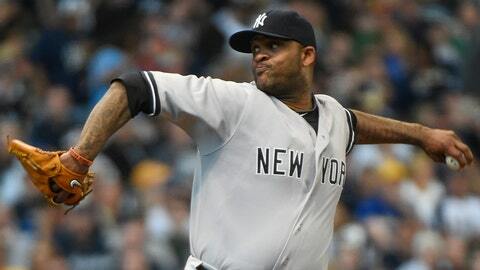 Using six starters early could alleviate some of the stress on fragile arms in that Yankee rotation. Had you asked me if I thought a six-man rotation was a good idea when I was wearing the uniform, I would have told you it was a dumb idea and that you were overthinking the game. In light of recent trends in baseball though, the concept warrants some examination. The Tommy John epidemic is real, and searching for an absolute answer as to why elbow ligaments are snapping at an alarming rate has escaped even the best orthopedic doctors in baseball. Pitchers are throwing too much, pitchers are throwing too little, there’s too much long toss, not enough, guys are training too hard, velocities are too high, kids are pitching too much, too soon, mechanics aren’t right, the hard cutter and slider are elbow killers and so on and so on. All are possible culprits, but there is no one single smoking gun. And while an answer to the question is not so simple, I can’t help but wonder if the six-man rotation would at least alleviate some of the injuries plaguing pitchers in this generation. Let’s take a look at some positives and negatives of using a six-man rotation. A full season of a six-man rotation would drop games started for a full-time starter to 26-27 over the current 33-34. Six or seven less starts means anywhere from 35-50 less innings. Less starts over the course of the season theoretically means top starters should be stronger for the postseason. Last postseason we saw Clayton Kershaw run out of gas late in both of his NLDS starts, allowing a combined nine runs in the seventh inning of both games. In 2013, Kershaw threw 259 innings over 37 combined starts in the regular and postseason. The five days off between starts (sometimes six) means more recovery time. This should mean stronger, healthier pitchers. With long-term deals for pitchers almost never working out by the end of the term, the odds of a team getting a stronger long-term return on their big investments should increase. Pitching is deeper than ever and some teams (not all) have the depth to use six starters. If I’m paying a starting pitcher north of $20 million per season, do I really want to use him 18 to 20 percent less than I am now? You need your top starters to win a division or secure a wild card spot. Falling a game or two short knowing you could have thrown your ace a few more times that season would be tough to swallow. Asking pitchers to change their routines and sit around an extra day is not an easy sell. Pitchers are creatures of habit, and some hate the extra day of rest due to something like a team off day, a rain out or the All-Star break. Not all would resist, but many would. An interesting candidate for the full season six-man rotation in 2015 would be the Washington Nationals. They currently have six starters who have won 10 or more games in 2014, as well as posted ERAs in the range of 2.41 – 3.57. It’s likely that Tanner Roark is headed to the bullpen to start the season. Washington signed Max Scherzer to a seven-year, $210 million contract this winter that will take him through his age-36 season. I wonder if the Nats would prefer the idea of Scherzer making 27 regular season starts over the seven years as opposed to leaving things as is and making the 32+ starts like he has done the past four seasons. Probably not. Another candidate would be the New York Mets. It appears that Dillon Gee might be squeezed out of a rotation that already includes Matt Harvey, Zack Wheeler, Jacob deGrom, Bartolo Colon and Jonathon Niese. Top prospects Steven Matz and Noah Syndergaard could also see some major-league time this season. With Harvey making a return from Tommy John surgery, the six-man rotation provides the Mets the perfect opportunity to control Harvey’s workload without shutting him down early or giving him any extended periods of rest during the season. In researching this idea I assumed the performance numbers would support the concept. They don’t. Take a look at this MLB starting pitcher data from 2010-2014 via Stats, Inc.
Generally we stay away from ERA and batting average against as indicators of pitcher performance, but when we are up over 4,000 starts, I find it usable. The data is rather surprising. There are no signs of improved performance with extra days of rest and if anything, we have seen a slight tick down with more off days in between starts from 2010-2014. We don’t have any usable data on how five or six days rest would affect starting pitchers over the course of a season in regard to injuries because we have never done it in MLB. They have done it Asia, however. Yu Darvish suggested last season that MLB teams should consider going to a six-man rotation like they do in Japan and Korea in an effort to reduce arm injuries. The problem with the notion of “they do it Asia” is that in the four years I spent pitching in both Korea and Japan, I saw more arm injuries than I did here. I remember one day sitting in the bullpen and looking around at my teammates, every one of them had a significant arm injury at some point in their professional career. The frequency in which they throw away from games is an easy answer as to why. The problem in assessing the Asian angle to the six-man rotation idea is that pitchers in Asia throw considerably more in spring training, in between starts, in the off-season and as amateurs. I tell these stories often but I have seen bullpens in spring training where pitchers threw 151 pitches, 247 pitches and then the final topper in 2009, 300 pitches. That is insanity. The conclusion is this: We likely won’t see a six-man rotation anytime soon. We’ll see it at times, for a small portion of the season, maybe one or two times through the rotation, but never for a full year. There is just too much at stake when you ask pitchers to change. Too much at stake and too much fear in an organization that isn’t putting their best arm on the mound as often as possible. It’s an interesting idea, but it’s a risk not worth taking.